Korean manufacturer Hyundai this week unleashed its all-new i20 World Rally Championship challenger. And it’s a car that the firm hopes will take it up a notch in the fight against Volkswagen – the sport’s benchmark team for the past three years. With just the 2016 season remaining before big changes to the technical regulations come into force, the i20 has just one more year to prove itself. Hyundai has put a huge amount of testing mileage on the new car, which is designed, built and run from a base in Germany. Almost 5,000 miles have been racked up in a bid to stop the VW steamroller – in its three years in the WRC, VW has won 34 of the 39 events it’s tackled. The team’s three drivers from 2015, Thierry Neuville, Hayden Paddon and Dani Sordo, have been retained for the three-car effort, while Kevin Abbring will remain as a development driver. Belgian Neuville has much to prove next year and beyond after a lacklustre 2015 season. A maiden victory for himself and Hyundai came in Germany during 2014, and he’ll be out to add to that tally. The team will rotate its three drivers among the two lead cars and one second-string entry, depending on each driver’s particular strength on a given rally, although the team insists all will have equal chances in the Drivers’ Championship. 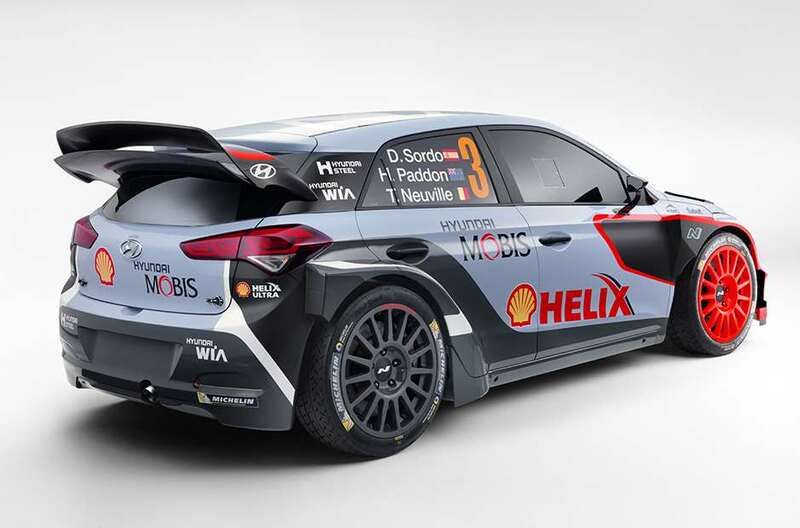 The all-new i20 WRC makes its World Championship debut on the legendary Monte Carlo Rally on January 18 and, with a bit of luck, will thrill crowds at the Festival of Speed in June.